Everything you need to qualify for the IRS Annual Filing Season Program (AFSP)–Record of Completion for the 2020 tax year! The 2019 Gleim Annual Filing Season Program is specifically crafted for those who wish to obtain an IRS AFSP–Record of Completion. The Annual Filing Season Program includes the Gleim Annual Federal Tax Refresher Course, a 2-hour Tax Ethics CE course, and 10 hours of Tax Law CE courses. The AFSP allows you to be included on the IRS public database of return preparers and differentiates you from other preparers. 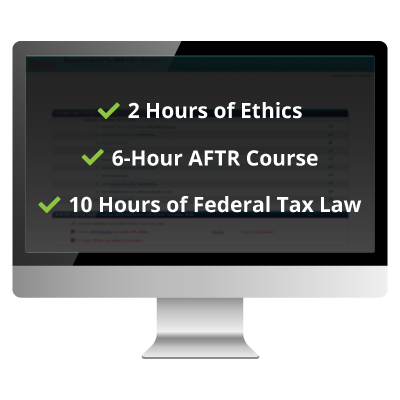 A 6-hour course covering filing season issues and tax law updates culminating in a comprehensive, 100-question test. Four attempts to pass the 100-question, End of Course test are permitted. Upon completion of each element of the program, Gleim will report your credit to the IRS. Completing all elements qualifies you to apply to the IRS for the AFSP–Record of Completion. *This course can also be used as a general 1040 Refresher course for any tax preparer. It cannot, however, be used as CE for EAs, and it may not be accepted for CPE by state boards of accountancy. Exempt Individuals: Have you passed the RTRP exam or Part 1 of the Enrolled Agent Exam, or do you meet any other requirements for exemption from the Annual Federal Tax Refresher Course? If so, you need only to complete the Gleim AFSP 15-hour CE Bundle for AFTR-Exempt Tax Preparers in order to qualify for the IRS AFSP–Record of Completion for the 2019 tax year. Click here for more information. Enroll in this online self-study program at a special price of only $99.95 for a limited time.